- Leave the big stick at home. Unless driving is the best part of your game, keep the ball in play by using a 3-wood off the tee. 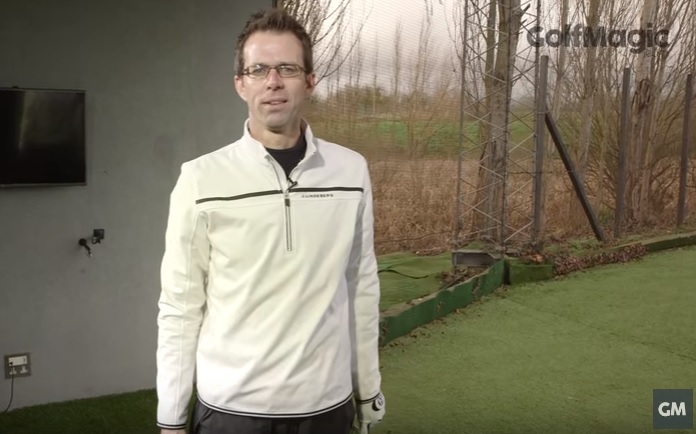 - Practise chipping with your feet together. Start slowly and build your way up. It allows you to feel the flow of your swing, and gets the top and bottom half in sync. - Make the club work. To propel the ball efficiently you need to get speed in the shaft. Often players in this scoring category have a flawed grip, often in the palm, which stops them creating speed and allowing the club to do the work. As a result, the body gets too active. The result is powerless effort rather than effortless power! To simplify things and make it easy to repeat, position the club in the fingers. This will allow the wrists to work correctly. From this better base, create a "L" shape between the forearms and wrists back and through. You should feel a sense of speed and hear "whoosh" in the shaft. The body will then calm down and blend in. The ball should rocket for miles. - Pivot on your pitches. Players scoring in the 90s, will often end up 20-30 yards from the green after their approaches - to hit these pitch shots well, keep your weight a little forward, and be sure that your chest continues to turn through impact. - Keep it constant when putting. Be sure that the rhythm is kept at a constant back and through, keep the pace the same, and allow the length of the backstroke to determine the distance the putt goes. - Hold your finish. On every full shot check you are able to hold the finish of your swing for at least a count of three, this will encourage a nice in-balance motion without any extra effort.